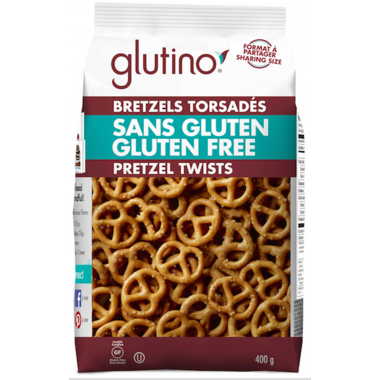 Glutino Gluten Free Pretzel Twists are perfect for any occasion! Ingredients: CORN STARCH, POTATO STARCH, WHITE RICE FLOUR, CORN SYRUP SOLIDS, PALM OIL, SALT, CANE SUGAR, CARBOXYMETHYL CELLULOSE, SOY LECITHIN, SODIUM BICARBONATE, YEAST EXTRACT, SODIUM ACID PYROPHOSPHATE, CITRIC ACID. CONTAINS SOY. This is a really good pretzel that I have had before. Sometimes gluten free means taste free, but not in this case!